Our cooking stove and house and water heater. Sitting by the fire on a cold winter’s night is so pleasant isn’t it? I love to sit and knit or spin by the fire when the day’s work is done. 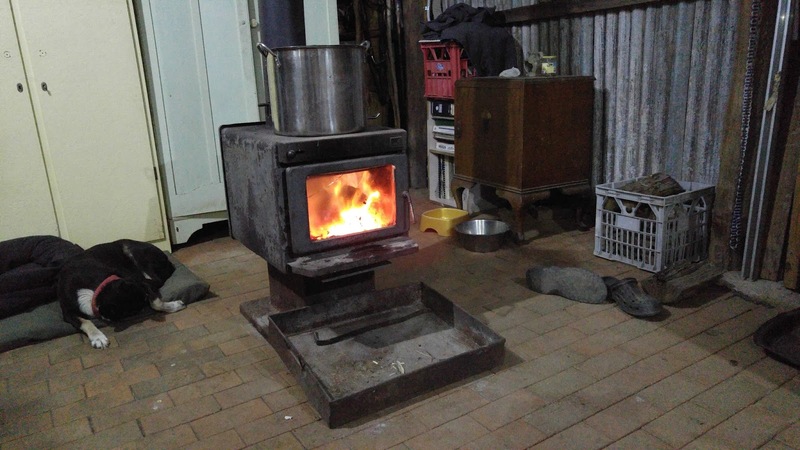 Our stove is a third hand wood heater we inherited from my partner’s parents during a shed clean up. It had fallen off the back of a truck (literally, not figuratively) and had a crack in the corner. We took it home, got a new flue piece made up (by a local engineering genius) and put it in the humpy. That was five or six years ago, it has never given us any trouble and if fed right stays alight from about June until September. 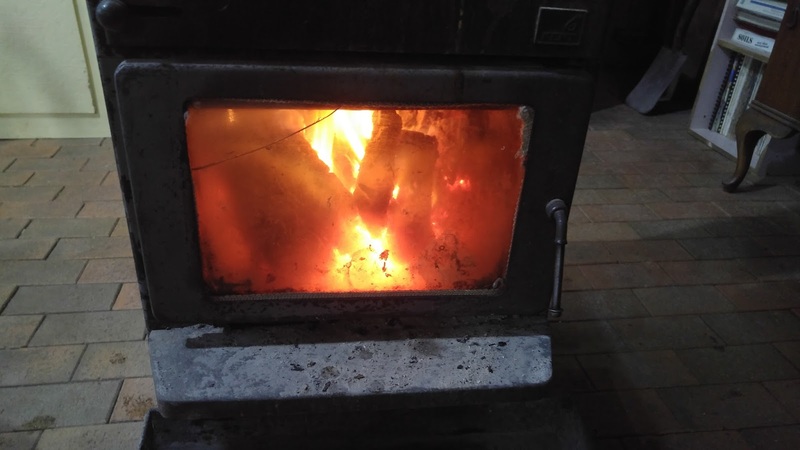 The fire gives us heat for our home, hot water from the eternal boiler on the top of it and a stove to cook on. All it asks in return is a steady flow of wood. 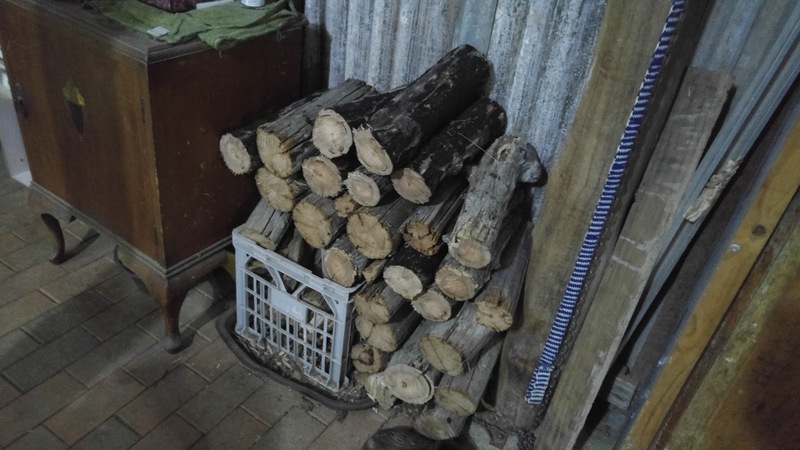 We are lucky to own enough land to supply our firewood needs, in fact harvesting wood in the form of fallen branches and logs is part of our fire safety plan. Fallen branches and dead trees are a bit of a fire hazard close to the humpy. Sparks from piles of burning wood can drift into the humpy via a multitude of gaps and holes, setting the whole place alight. The usual solution is to burn off; set sections of land alight and control the burn, removing fuel from the area. To me it always seemed sort of counter-intuitive to say to yourself “Hmm, that looks like it might burn….could be dangerous….I’d better set it alight”, not to mention the multitude of small reptiles coming out of torpor and the tiny birds with nests in the grass who have their first batch of babies for the year in the early spring (when most people burn off). Our solution is to collect as much of this fuel as we can as fire wood within a 50 meter (about 50 meter) radius of the humpy. We don’t collect wood from the whole property as a lot of birds and animals use fallen branches and logs as homes. In fact the Bush Stone Curlew has been driven almost to extinction by people who are too neat as they use tangles of fallen branches to nest in and their breeding has dropped due to lack of nesting sites and cover for foraging. 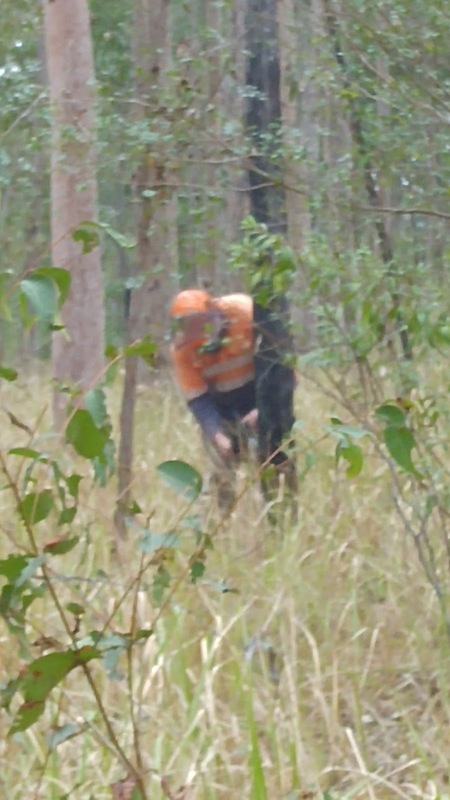 Anyone who lives in the bush will tell you that wood lying on the ground will absorb water and not burn well and that a lot of types of wood (tree species) are no good for firewood. This is unfortunately true, the usual solution is to fell a standing dead tree. Large dead trees, and sometimes small ones too, are generally homes to possums, gliders, birds and insects so we try not to cut down standing trees very often. 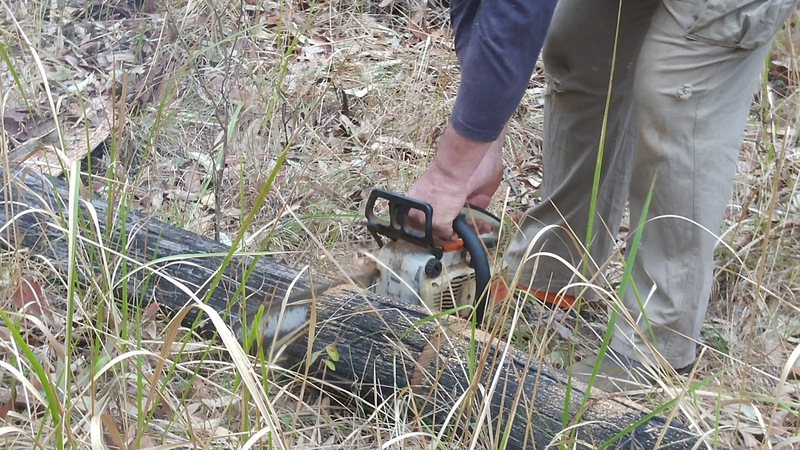 However, because the wood we gather from the ground is sometimes damp or does not burn hot enough, we sometimes cut down small standing dead trees to mix with it. We choose very small standing trees and check them for life as best we can before cutting them down. 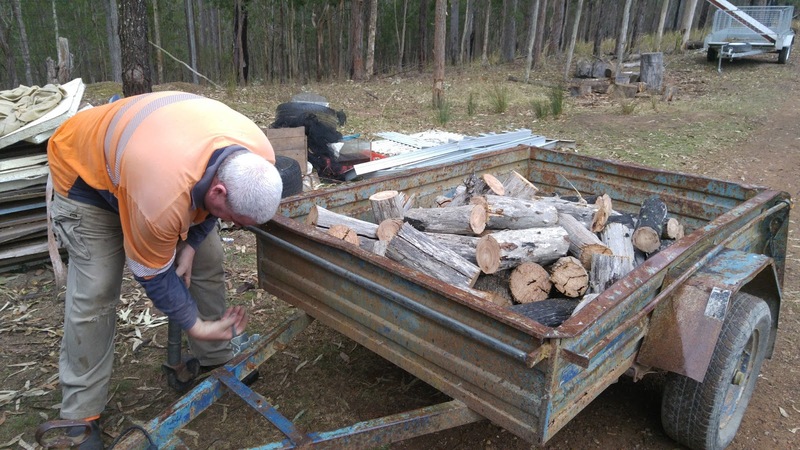 While collecting firewood may seem like a simple weekly task, it actually has a lot of considerations attached to it (for us at least). We try not to disrupt the ecosystem of our property while carrying out our daily life, we try to minimise the dangers inherent in living in the bush and we try to make the best use of our resources. These concerns are sometimes in conflict and compromises have to be made. 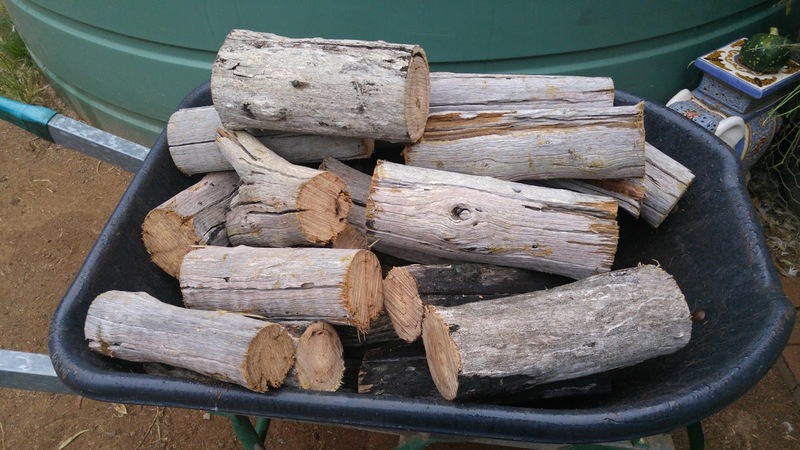 Do you collect firewood? What are your considerations?